UPDATE: Now that the free week is over, you can read the rest of this story by downloading an ebook from Smashwords or Amazon. Then you can read it on your laptop, desktop, Kindle, iPad, Nook, iPhone, or whatever device you use to read ebooks. This story picks up very soon after the events of last week’s story, “Explosions.” This is the first time it’s been published as a story, though it does appear in my SF novel The Wannoshay Cycle as well. Terri Johnson was already sweating as she walked west down Milwaukee’s Clybourn Avenue, the trucks on the interstate to her left making her flinch with every shuddering of their air brakes. 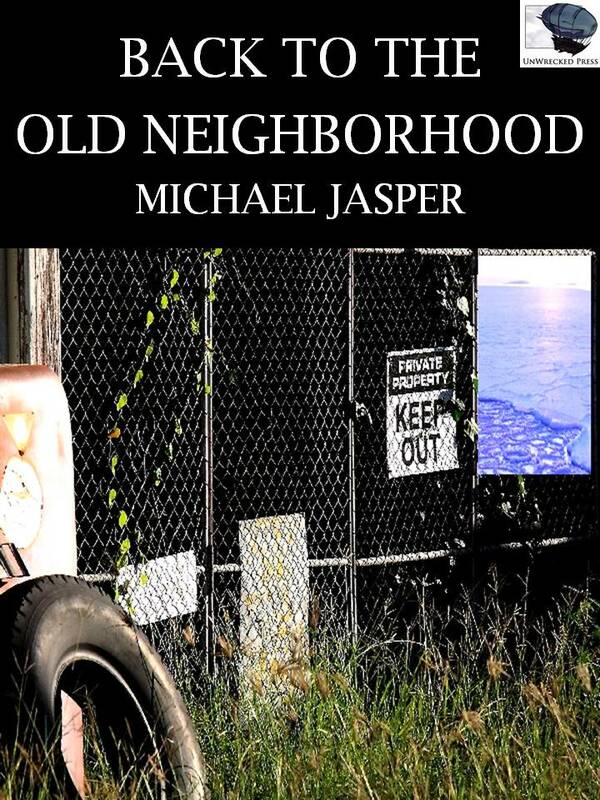 On either side of the street sat dead gas-burning cars, windows broken out and bodies turning grayish-red with rust. She kept her distance from them, afraid that she’d come across one of the aliens huddled inside. After walking for over an hour, she’d passed her old apartment three times. Despite the familiar landmarks of the abandoned cars, the rundown stores, and the apartment entrances, Terri felt lost in her old neighborhood. In her pocket were two bus tickets, bought with the money card the Netstream reporter had given her in exchange for her eyewitness version of the brewery explosion. But before getting on the bus with her daughter, Terri had one person left to visit before leaving Milwaukee: Nonami. She cringed at the childish way she’d come up with the alien’s nickname: “no name” became “Nonami.” She wanted to thank the Wannoshay woman for getting her out of the burning brewery yesterday, and for helping get her and Toshera out of Milwaukee, even if it wasn’t the way Terri had planned it. Then, after thanking Nonami, and after Nonami had told Terri her real name, they would talk, woman to woman, about what had really happened yesterday, and what would happen next. At noon, the heat of the day was at its peak, and the streets were empty. The southern side of the street was scarred with fire from one of the anti-integration riots from a month earlier, though some group, either humans or aliens, had been the slow process of repairing the broken buildings in the neighborhood. Even in the winter, on the coldest Wisconsin day, there had always been at least three or four people out on their front steps or huddled around a fire built in a barrel. After she and Toshera had been there for three months (their probationary period, just like the one she’d had at the brewery when she first started there), her neighbors had come to the conclusion that she wasn’t some transient, and she was in the Clybourn neighborhood to stay. After that she never felt afraid there, even after dark, because she knew her friends—black, white, or otherwise—were watching out for her. Then the aliens came. Due to sudden spikes in rent, Terri and her daughter Toshera had been forced to find a new place to live, in a worse neighborhood than this one. Not a week later, the Wannoshay had moved into Terri’s old neighborhood. And then there was the brewery explosion yesterday, which happened at almost the same time as an elevator explosion in South Dakota. The aliens had just starting working at the brewery and a few other carefully chosen locations, and most people didn’t think either explosion had been an accident. Okay, Terri thought, stopping in front of the last building on the block. This place is as good as any other. Blotting the sweat from her face with the sleeve of her T-shirt, she walked up to the first apartment on the ground floor. She knocked, wondering if the Wannoshay knew what that meant. Apparently the elderly female who answered the door a second later did. The aged alien’s eyes grew wide when she saw Terri. Her long, blue-tinged hair stretched toward her like tiny fingers. “Come!” the female said. Her voice sounded like she had a mouthful of marbles. Opening the door all the way, the older alien woman bowed her head and reached out a hand. She was a shade taller than Terri, and her musky smell was sweeter than Nonami’s. Terri stepped back unconsciously, and then let the woman’s cool hand touch her own. She didn’t feel either the electric tingle in her chest or the ringing in her ears she’d felt with Nonami, but there was a tiny thrill at the touch of those four fingers. Before she knew what was happening, Terri had been pulled into the apartment. She didn’t even have time to scream. Read the rest of the story as an ebook from Smashwords or Amazon. Interested in the aliens in this story?